Kodi supports both stand-alone subtitle and embedded subtitles. Most major subtitle formats are supported. Kodi can also search and download subtitles directly from full screen playback. The audio options are found under the gear icon. Various subtitle settings can be changed or they turned On/Off (default is on) via the OSD (On Screen Display) while watching a movie by selecting the subtitle menu or audio options. 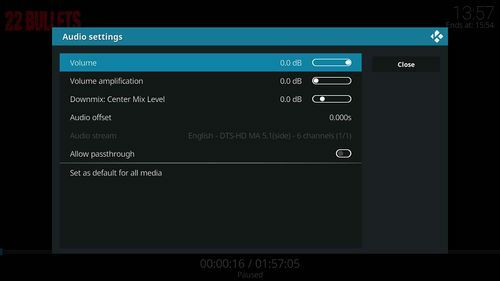 Note: To make Kodi turn off subtitles by default: While playing a video, bring up the on screen display and select the audio options -> Turn off "subtitles" -> scroll down and select "save as default for all videos". Enable or disables subtitles. Subtitle tracks with the "forced" flag are unaffected by this and should always display. Allows you select which subtitles are displayed. If only one subtitle track is available, this option will not be available. The position of the subtitles can be adjusted vertically (but not horizontally) in the Video Calibration screen, you can also configure the way that they are displayed though the Subtitles Settings. Note: This does not apply to DVD subtitles as the DVD itself defines their location. ActivateWindow(subtitlesearch) can be bound to a remote button using keymaps in order to quickly bring up the subtitle search window. To use stand-alone subtitle files with video files, put them in the same folder as the video file or alternatively go to the Subtitles Settings and set a Custom Subtitle Directory. You can also choose to manually browse for the subtitle file via the OSD (On Screen Display). You can configure the way that they are displayed through the Subtitles Settings, and you can adjust where they are displayed onscreen through the Video Calibration Screen. Kodi also supports compressed VobSub subtitles. Please note that the subtitles inside the RAR archive still need to have the same name as the video file and requires the rar add-on being installed: See: RAR archive support. Where The Matrix.rar containins the VobSub-file The Matrix.sub and the The Matrix.idx VobSub index-file that has been compressed with RAR. If you want Kodi to automatically turn on packed subtitles, you have to turn on the Search for Subtitles in RARs option in Subtitles Settings. Kodi supports the use of more than one external subtitle. This of course is most useful when you have more than one subtitle file, (eg. for more than language). The dot after the filename but before the extension specifies the language (you can use anything here, mix numbers and and letters or just use one or the other). Change the two values between the tags to fit your situation. If you have an existing file, make sure the <video></video> tags, and settings we'll add between them, are between the main <advancedsettings></advancedsettings> tags. Many movies have subtitles encoded for secondary languages spoken during the film – when these are added to the movie, they are known as forced subtitles and are always visible (despite not being hard encoded). As of Gotham, Kodi recognizes and respects the forced flag for showing subtitles (even if subtitles are turned off by default, the forced flag will trigger them being turned on). This requires that the user have set the default languages in Settings in order to function properly. If there are multiple forced subtitles, Kodi will select the forced subtitles that match the default playback language. If you are using an .mkv file, the forced subtitles may be included in the file when originally encoded. If so, Kodi will automatically recognize that they are present and will display them at the appropriate times. If they are not included, or if the header was not properly edited, you will need to use external subtitles. This page was last edited on 19 October 2018, at 07:29.